The techie playing the chef, the Dosa Queen - You have met Pratibha Garre of The Chef And Her Kitchen. This chef has innumerable varieties of recipes up her sleeve, the passionate foodie dishes out lip-smacking everyday and celebration food out of her her kitchen with equal elan. Her dosa tawa sizzles with numerous varieties of dosas, her parties see new appetizers every time, her pickle and pachadi jars are enough and more to keep you drooling for quite some time! Andhra and Karnataka cuisine predominantly and quite a lot of baking await as you explore her space. Take a break from the usual pani puri and try this unique Bangarpet Pani Puri, capture the goodness of mangoes in this delicious Mango Fudge, the goodness of whole wheat, oats and bananas in Eggless Whole Wheat Banana Muffins, chocolate and vanilla tango in an eye-catching Chequered Cake. This is just a teaser, so do stop by her space if you haven't yet! 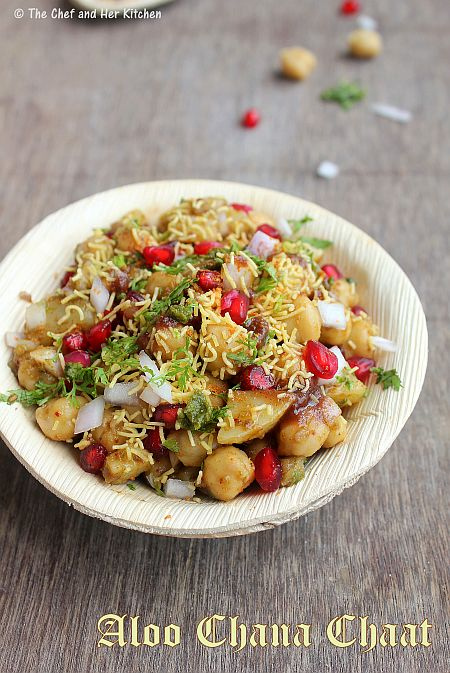 Thanks Pratibha for the tongue-tickling Aloo Chana Chaat, I could eat it off the screen of my monitor! Without further ado, over to Pratibha..
First of all let me thank Suma for giving me the opportunity to write a guest post on her blog.When she asked me to do a guest post I readily agreed to do it. After running through a couple of ideas, I decided to firm up on Aloo Chana Chaat. 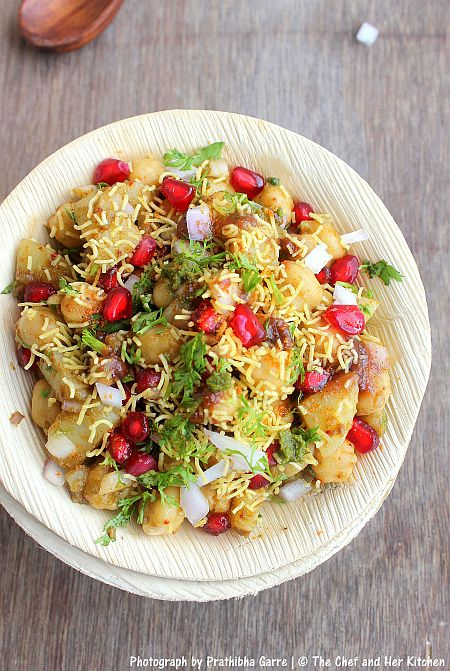 The word 'Chaat' makes my mouth water,in fact it is the same with many of you,agree? 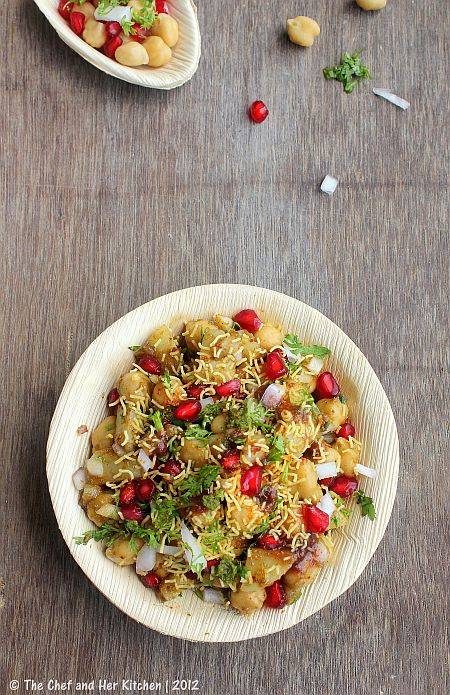 ?I usually have any form of chaat atleast once a week to satisfy my cravings. I normally ask the chaatwala to make a chaat according to my personal preference and its fun to watch various ingredients being mixed to create unique flavours. 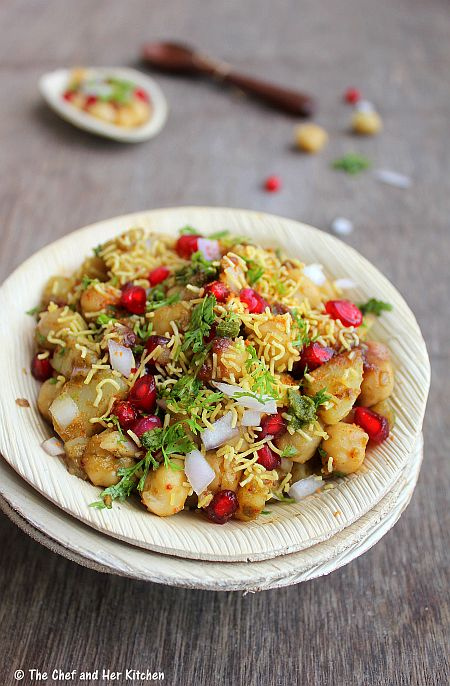 This Aloo chana chaat is very simple,once the preparation work is done ahead, you hardly need two minutes to stir and serve this yummy chaat. 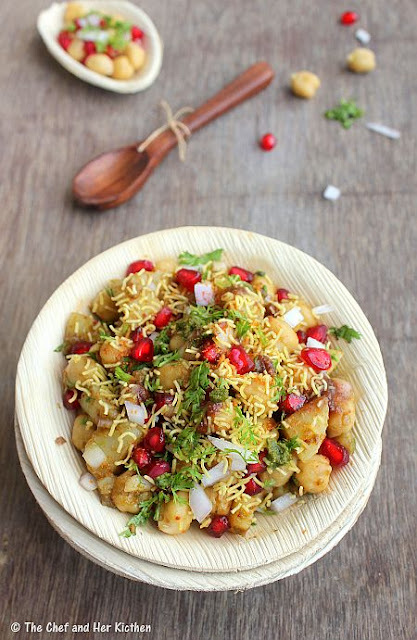 More over it is a healthy chaat which gives a good dose of protein and carbohydrates with little or almost no amount of fat.You can make this as an evening snack or serve it as a salad or appetizer in parties. One can make this ahead and refrigerate it for 1-2hrs and garnish them with a liberal dose of sev while serving. Soak chickpeas overnight for 8-9hrs and wash them and pressure cook with enough water for 3 whistles,reduce the flame and cook for another 10 mins.Chickpeas should cook thoroughly and soft but firm and also should not become mushy.Drain them and keep them aside to cool. Pressure cook potato for 3 whistles along with chickpeas or separately.Let it cool completely and then peel the skin and chop into small cubes. In a bowl add imli-kharjur chutney,green chutney,salt,chaat masala,red chili powder,roasted cumin powder and give a nice stir until you get a uniform paste. Add boiled chickpeas,boiled and chopped potatoes,finely chopped onion,coriander leaves,pomegranate kernels,slightly crushed papdi and give a nice stir.Check the taste of it and add any seasoning like salt or more chutneys to suit your taste buds. Serve them into two individuals bowls.Garnish with chopped coriander and sev. Serve the chaat immediately. You can even refrigerate for sometime and eat,it tastes good too, just garnish with sev before serving. *The addition of papdis are optional,it gives a nice crunch and adds the taste to the chaat.You can even replace them with crushed pooris if you have.You can totally avoid puris/papdis in the recipe,still it tastes good. The addition of amount of chutneys are completely left to your choice.Please feel free to add or reduce the spices and chutneys according to your wish. One can replace kabuli chana with kala chana in the recipe.But I prefer the kabuli chana version better. You can replace Kharjur-Imli chutney with meethi sonth(marwadi meetha chutney) in the recipe. For a healthier version avoid papdis/puris in the recipe,which make the recipe guilt free. If you liked my Chaat,do not forget to come back to my blog and let me know what all you liked about this chaat.I would be happy to hear from you...and once again thanks Suma for having me here. Suma,I am really flattered with your lovely words..Thanks a lot dear,I hope u liked my post. This is a yum post> I do love Pratibhas posts the pics and dishes are truly delicious. Archana's Date And Banana Cake - A Guest Post..